21 People Are Treated After Nerve-Agent Attack On Ex-Spy, U.K. Police Say : The Two-Way British authorities say Sergei Skripal and his daughter were specific targets of the poisoning but now it appears that more people were affected. 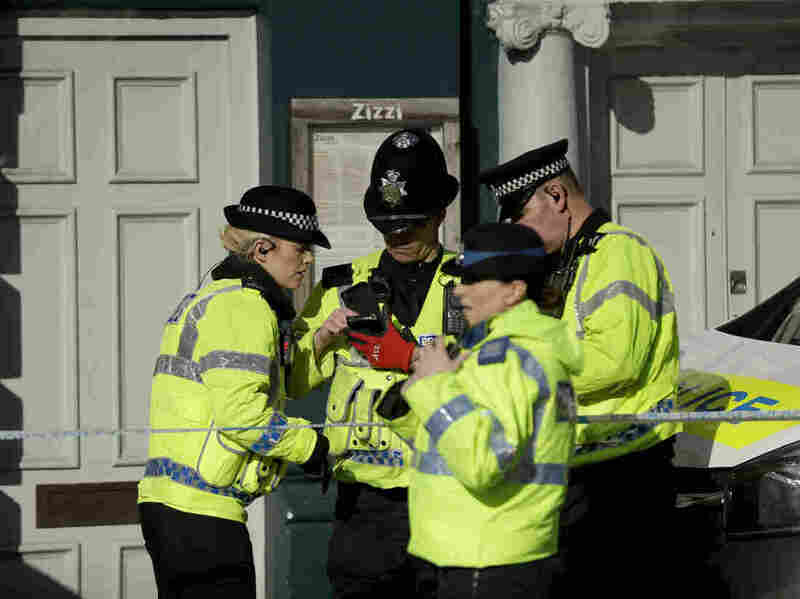 Police officers in Salisbury, England, near where former Russian double agent Sergei Skripal was found critically ill.
British police say around 21 people sought medical treatment in the wake of the nerve-agent poisoning last weekend of a former Russia spy living in the U.K.
Sergei Skripal, a former Russian colonel and military intelligence officer, was found unconscious on Sunday along with his daughter in Salisbury, about 90 miles southwest of London. They, and a British police officer who attempted to help them, remain hospitalized. There is little risk to the wider public, say local health officials. However, the Associated Press quotes the Wiltshire county acting police chief as saying that "around 21 people" have been treated and that "a number" received "blood tests, support and advice." Skripal and his 33-year-old daughter, Yulia, are reported to be in critical condition. The police officer, Sgt. Nick Bailey, is in serious condition, though he has been conscious and able to talk. British authorities suspect the Russian government is behind the attack, the Washington Post reports. "Foreign Secretary Boris Johnson said Tuesday that the Skripal case had 'echoes' of the assassination of Alexander Litvinenko, a former KGB operative and a fierce critic of the Kremlin who died in 2006 after drinking tea that had been laced with radioactive polonium — a high-profile hit that a British investigation found was "probably approved" by Vladimir Putin himself. "Indeed, as Britain [has] become a home for many Russian emigres, an alarming number of Kremlin critics residing in the country have died in mysterious circumstances. Although British authorities have rarely pointed the finger at the Russian government, the use of a nerve agent in the Skripal case has renewed concern about Kremlin involvement." But proving Russian government involvement is another matter. It has denied any involvement in Litvenko's death or the attempt on the Skripals' lives. Yet as the Post adds, British authorities attached strong words to their suspicions. "British Home Secretary Amber Rudd said Thursday that authorities were avoiding speculation but that Britain 'would respond in a robust and appropriate manner' and that it was committed to bringing the perpetrators to justice, 'whoever they are and wherever they may be.'"